I found out about the restaurant while searching for a place to enjoy dinner near Lincoln Center on a Friday night, for we had tickets to the Met Opera that evening. I made my reservation about a week in advance, and appreciated getting a call to confirm the reservation the day before—and also being asked if we had any performances to attend that evening so they’d be sure service kept us on time. That was a nice touch. We had two hours to enjoy dinner, though, so we were in no real rush. “Masseria” is a type of “fortified farmhouse” as you will find in the Puglia region of Southern Italy. There, many such farmhouses today have been transformed into restaurants and hotels, and that is the environment being emulated at Masseria Dei Vini. Executive Chef Pino Coladonato is from Bari in Italy, and much of the menu reflects his roots. The cuisine of Puglia relies heavily on seafood and fresh made pasta, and that is what intrigued me when I first checked out their menu online. There is also a wood-burning pizza oven to prepare Neapolitan-style pizza, which we did not get a chance to try this time around. Perhaps on our next visit to New York. 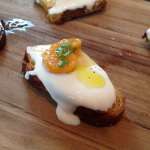 There are indeed almost too many tempting options to try on their menu, which is divided into appetizers, salads, crudo (raw fish and shellfish), pastas, pizzas and entrees. I wanted to eat somewhat light on our first night there, since it was an early dinner (5:30) and we’d had a satisfying lunch. So I decided to go with a salad to start, and then a pasta. Sweetie wanted to do a pasta and then one of the fish entrees, and our waiter was kind enough to offer a half-portion of the pasta instead of the full entree amount. With a name like Masseria Dei Vini, one would except a wide and quality selection of wines to be available, and that is certainly the case. Of course Italian bottles dominate the selection, but what was nice was how many were at affordable prices (in the $30-40 range) and also how many were available by the glass. I went with a Soave Classico from the Veneto region, which I thought would be a good match with the seafood-heavy selections we made. It was good as well with the tasty selection of bread and breadsticks provided for the table, along with a unique olive oil and lentil dip. 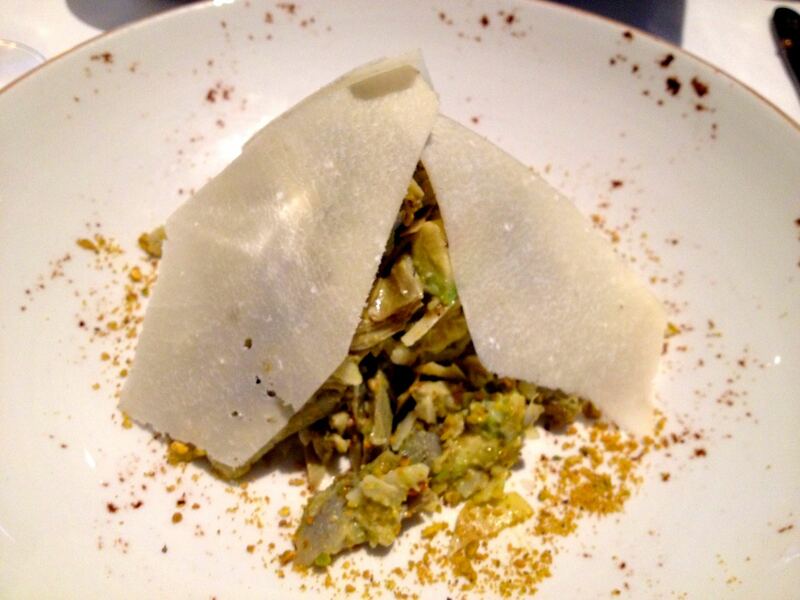 Our first courses came quite swiftly: mine being the Insalata di carciofi featuring artichokes, avocado, pistachios and parmesan cheese. This was a lovely, unique and very filling salad, sort of like an Italian guacamole, if you will. 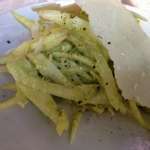 The pistachios added a nice crunchy element against the creamy avocado. 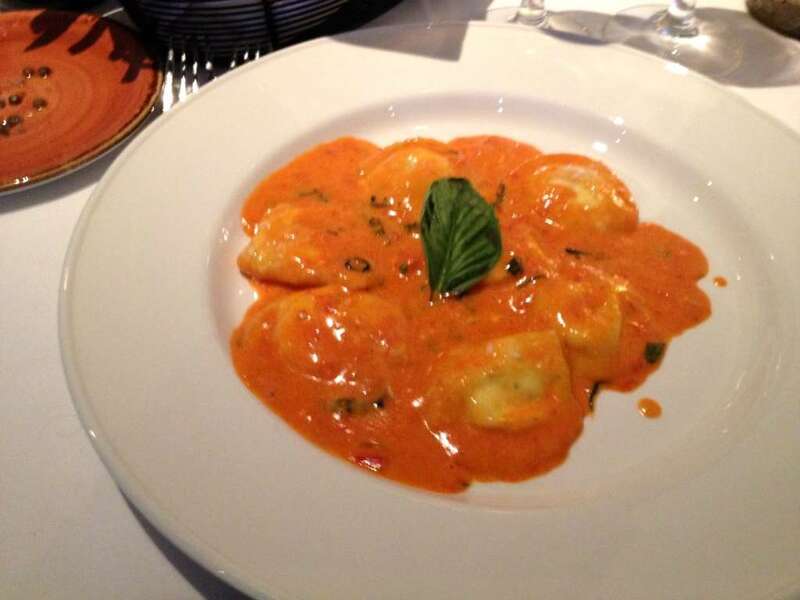 Sweetie had the Ravioli di Angelina: home made fresh caciotta chesse ravioli in a light tomato sauce, Capri style. These were outrageously good: light as a feather, delicately filled and in a sweet, slightly creamy tomato sauce. They may have been the best ravioli I ever tasted. Sweetie said he only regretted ordering a half portion as he could have easily eaten twice as many of them. 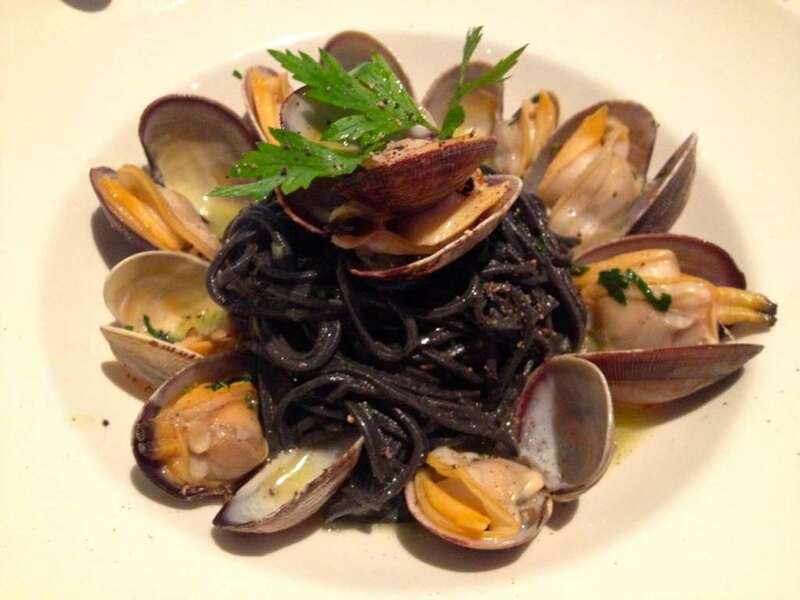 For my main course, I had to get the spaghetti al nero con vongole: squid ink spaghetti with clams, garlic and white wine. This is one of my favorite dishes every time I’m in Venice and this version did not disappoint. 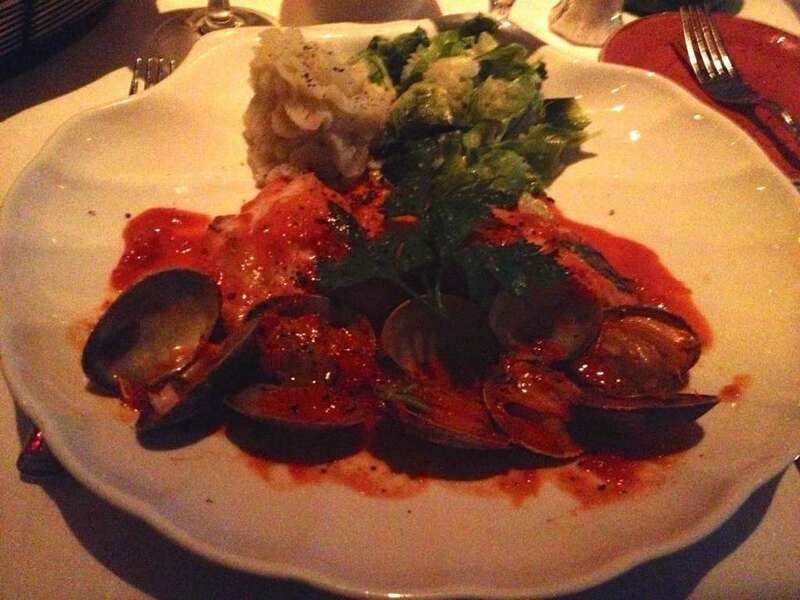 The spaghetti was perfectly al dente firm, and served with a generous portion of clams in shell. It was very filling and I could not even finish all the pasta, as delicious as it was. 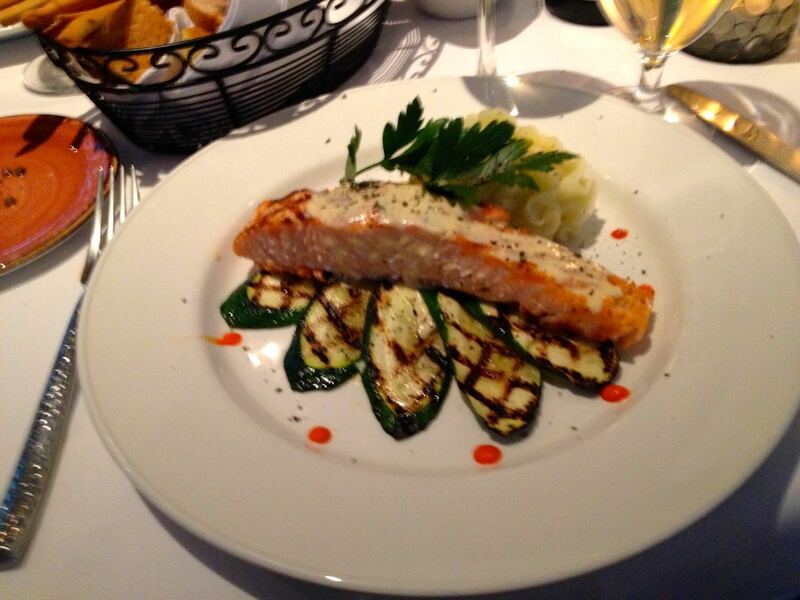 Sweetie ordered the grilled salmon with zucchini and mustard sauce. His good luck in ordering continued as this preparation was without a doubt the best salmon I’ve ever enjoyed in a restaurant. Succulent and perfectly cooked, the mustard sauce was not overwhelming but added a nice bit of complexity to the dish. 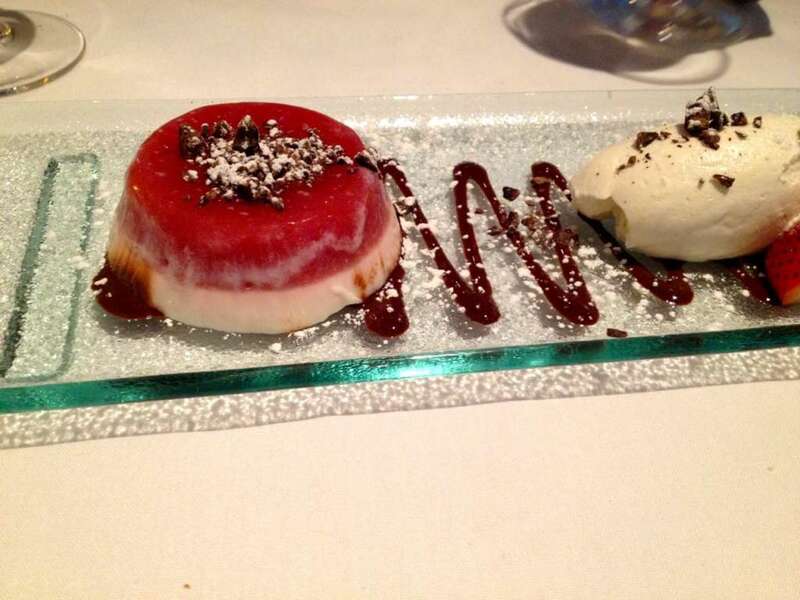 As full as we were, we had to share one dessert: a sumptuous and creamy panna cotta, as beautiful and delicious as everything else we’d tasted that night. I enjoyed mine with a lovely grappa di amarone while sweetie went for a double espresso. Surprisingly our whole wonderful meal came in at $160 before tip, which certainly seemed reasonable for the quality food and service we’d received all evening. As I mentioned earlier, our meal was so good we ended up returning the next night for a second dinner. (It also helped that the restaurant was only a block away from our hotel, and we were so tired from a day outside at the New York Botanical Garden that we didn’t want to stray too far afield that evening.) This time we were dining late instead of early: about 9:30, and the place was still absolutely packed. Our server recognized us immediately from the night before and it already felt as though we were welcomed as regulars. Our seafood selections had been so good the night before that we ended up ordered all courses spotlighting fish and shellfish. 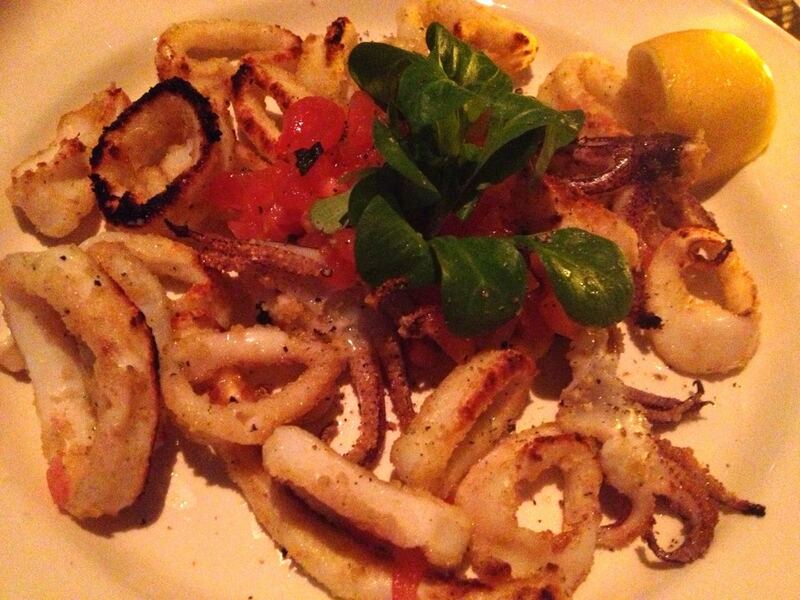 For starters, I ordered the Calamaretti dorati: baked calamari with herbs, garlic and breadcrumbs. This dish was like a more elegant version of classic fried calamari, not greasy at all and perfectly tender. Another definite hit. 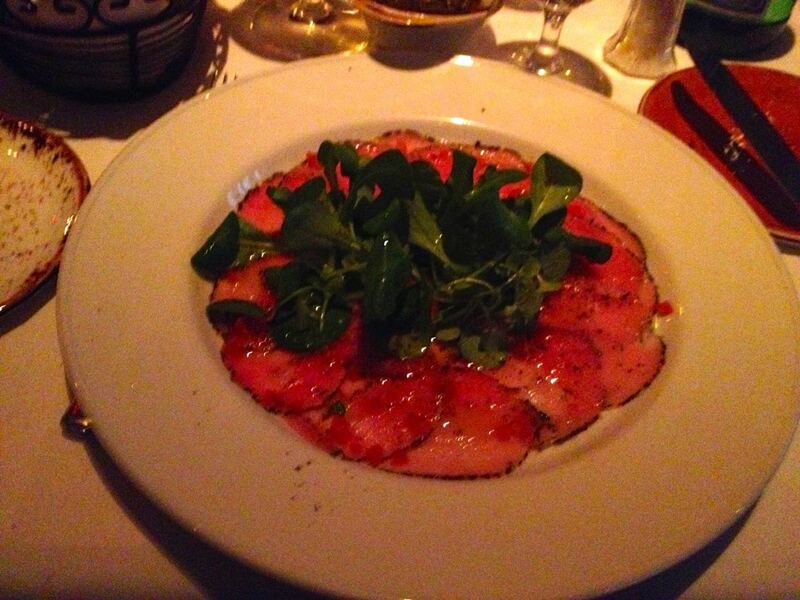 Sweetie went for the tuna carpaccio—originally he wanted to try the shrimp carpaccio, one of the restaurant’s signature dishes, but they were regrettably out of it. Another dish to save for “next time”, but the tuna was a perfectly fine substitute. For our main courses we went for two specials of the night. 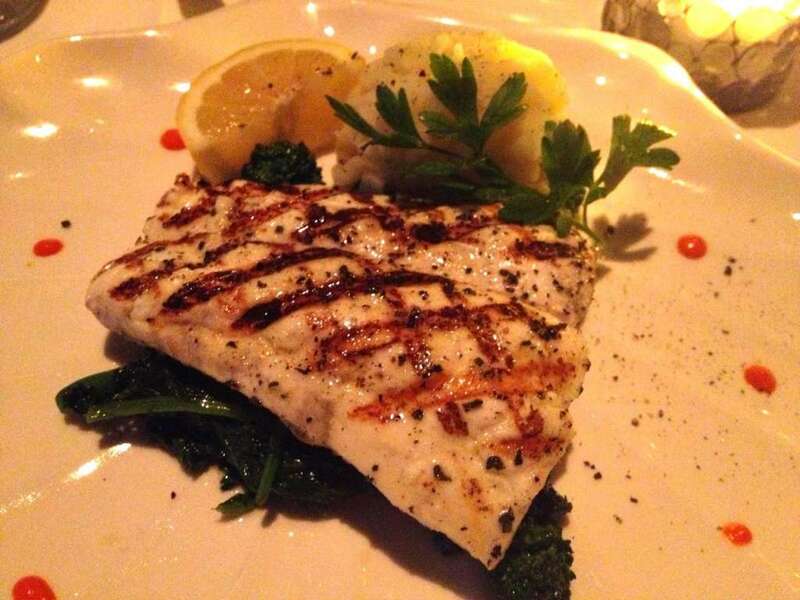 I had to order the halibut, as halibut is one of my favorite types of fish. This was expertly grilled, cooked through yet moist, and served on a bed of broccoli rabe. The bitter greens were a nice contrast to the sweet fish and not overly garlic-laden, which is the problem I have with a lot of broccoli rabe preparations in restaurants. Grilled halibut with broccoli rabe. Sweetie had a mahi mahi special, where the fish was served with more of those great clams I had the night before, and a red sauce which was reminiscent of the sauce from the ravioli we’d loved. No complaints at all about either dish. This chef really understands seafood on an expert level. 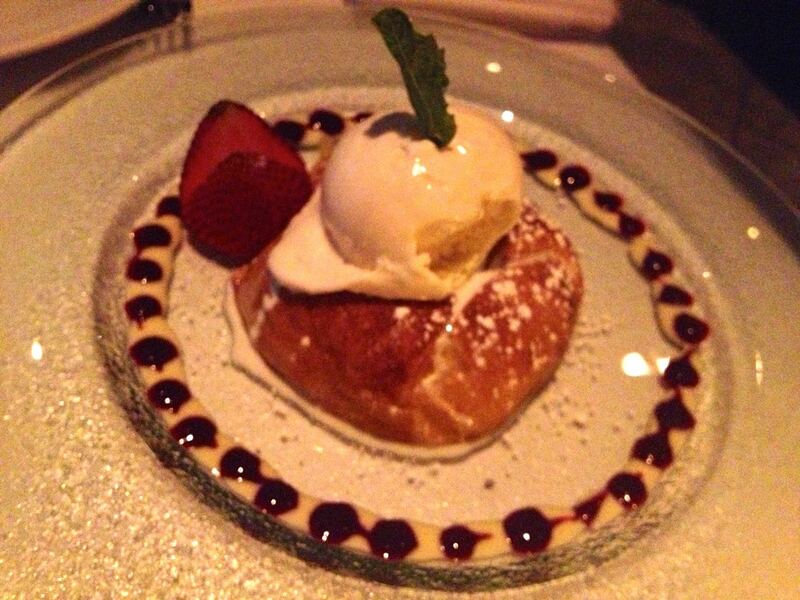 This time we decided to try the apple tart for desert. Beautifully plated it was yet another winner, warm and with a perfect pastry crust, not overly sweet, just soothing and comforting at the end of a great meal. This evening our bill was a bit higher: $200 before tip with another bottle of lovely Italian white wine (this time from Tuscany) and another grappa for me. No doubt this was because we ordered all seafood dishes and two specials of the day, which can always be more expensive than pasta and salad. But we had no complaints about the bill, nor anything that evening. Sweetie is still dreaming of those ravioli a week later and I hope we’ll have a chance to get back to Masseria Dei Vini sooner rather than later. I highly recommend you give them a try yourself should you find yourself in the area. 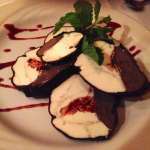 This entry was posted in General restaurant reviews and tagged italian food, italian restaurant, masseria dei vini, new york city, pasta, restaurant review, seafood. Bookmark the permalink.